Background and Objective: Non-melanoma Skin Cancer (NMSC) is the most common malignancy found in humans and currently 2-3 million cases occur globally and occur in the persons with light skin and less melanin content. It often appears as a painless, raised area of skin, which may be shiny or with the hard lump with a scaly top, but may also form an ulcer which may spread to other parts of the body. Nonsurgical management of NMSC could be a viable and effective treatment option, however, permeation of hydrophilic drugs such as 5-fluorouracil through the skin may hamper the success of topical application approach. Therefore, the aim of this work was to incorporate 5-fluorouracil in ethosomes using a Fractional Factorial Design in order to improve its skin permeation. Methods: The 5-fluorouracil ethosomes were prepared by cold method through 25-2 Fractional factorial design in which amount of Phospholipon®90H(A), Drug(B), Propylene Glycol(C), Ethanol(D) and Sonication time(E) was selected as independent variables and vesicle size(X1) and %Entrapment Efficiency (%EE)(X2) as dependent variables. Results: All the batches exhibited the vesicle size and %EE in the range of 74.43-653.8 nm and 34.64- 50.94%. The optimized batch of ethosomes (K3) exhibited 229.6nm vesicle size, 55.41%EE and 14.9mV zeta potential indicating suitability for skin permeation and stability of the formulation. During %In-vitro drug release study, Batch K3 indicated 69.30% and 59.18% of drug release after 12 hours as compared to 82.84% and 91.8% of pure drug in acetate Buffer pH 6.0 and phosphate buffer pH 7.4 respectively indicating the sustained release of drug. 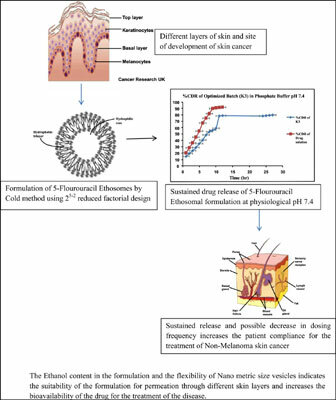 Conclusion: Thus, the prepared formulation might have potential applications of delivering the drug in controlled manner directly to the site of action by overcoming the limitations of conventional formulations and by enhancing drug penetration to deeper layers of skin, by reduce dosing frequency and thus with improved bioavailability for the treatment of non-melanoma skin cancer. Non-melanoma skin cancer, 5-fluorouracil, zeta potential, 25-2 fractional factorial design, phospholipon®90H, propylene glycol, %in-vitro drug release study.